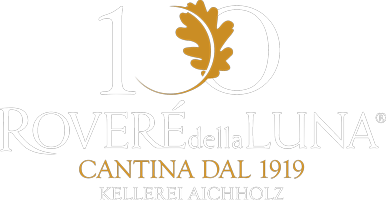 The line includes the Classic wines deriving from the typical varieties grown in the area surrounding Cantina Sociale Roveré della Luna. The famous full-bodied red Teroldego and Lagrein are cultivated here, vinified with vinesse in a long maceration, regional native vine varieties in the area of Roverè della Luna from the 15th century and Pinot Noir, its cultivation traced back to the end of the 19th century, a delicate wine with intensely fragrant scent especially appreciated by the most demanding consumers. Also the Schiava wines, regional native varieties, cultivated for centuries on the hills of Roverè della Luna, basic wine of the typical Colli S. Anna, a rosé wine delicately characterized by flower scent, with its characteristic taste of bitter almonds. Classic white wines are the native Gewürztraminer, cultivated on the calcareous hills of Roverè della Luna and the porphyric ones of S. Michele a/A, leading up to an intensely aromatic and flavourful wine. Characteristic and unique is Pinot Grigio, grown in the “Ischie“ area (dt. Mitterling) overlooking the Adige valley, fresh and light that gives, thanks to the dry and ventilated climate, a sensational aroma and fragrance. Finally Chardonnay, derived from the vine with the same name, produced with grapes coming from the hilly vineyards of Roverè della Luna and S. Michele a/A, unusually rich in aromas and flavours, and Müller Thurgau, reminiscent of the best mountain herbs, where it is cultivated with craft and passion. Intense fruity aromas (ripe pear), an important and balanced freshness make this wine perfect for aperitifs. It matches also with light appetizers and main courses based on mushrooms and soft cheese. A perfect aperitivo. Strong scents of apple, banana and grapefruit along with a pleasant freshness. Excellent also with grilled fish dishes. Aperitif par excellence. Very versatile thanks to an important minerality and a delicate aromatic complexity (citrus fruit, peach, hawthorn scents). Perfect in pairing with main courses based on simple cooked fish and seafood. Great structure and soft tannins. Its intense fruity and floral notes recalling raspberry, black raspberry and violet enhance game dishes with sauces, roasted red meat and aged cheese. A pleasant fruity fresh taste, matches with very different kind of preparations: from cheese and salami to typical mediterranean main courses; appetizing with pizza. Intense fruity notes of blueberry and raspberry with sweet spicy scents, great structure and persistance. Enhances game dishes, red meat and aged cheese. Ideal for grilled red meat and savory cheese with its intense red fruit notes and spicy scents along with an elegant smoothness.